Another patent has emerged which throws light on how Microsoft might be implementing its ‘pocketable’ dual-screen tablet – rumored to be the hardware side of Andromeda (as opposed to the software side: Andromeda OS) – and this shows how integrated cameras could be used to automatically adjust the volume of the device. Essentially, this is a solution to the issue of having a device with two screens, and running different apps on both those displays which might require different volume levels, further taking into account the user’s position relative to the screen (how far away they are, in other words). The patent itself describes a mobile computing device which consists of two hinged displays, with each screen having a forward-facing camera nestling next to it. Those cameras will employ face detection technology to determine which screen the user is looking at, and if, for example, audio is playing from an app on both screens, the device will increase the volume for the content of the screen the user is actually focusing on at the time – and subsequently adjust that balance if the user switches to look at the other screen. Or if one screen on the device is folded back so it’s not in use, the camera will detect that the user isn’t looking at this at all, so will mute the volume entirely. Scenarios are also described where the cameras will gauge the distance at which the user is viewing at, and if they move further away from the screen, the volume could be adjusted upwards to compensate. You will, naturally, still have regular volume controls for the device allowing you to adjust the sound yourself (and presumably the ability to override any automatic volume adjustment, in case you don’t want the feature interfering with your listening). This is certainly one of the more interesting patents we’ve seen for Microsoft’s rumored dual-screen device, and if implemented well, it could be a nifty feature indeed. We’ve previously seen a raft of patents including one for video calling on a hinged multi-screen device, and another showing a dual-screen tablet where one of the displays can become a virtual keyboard to emulate a traditional laptop. However, despite the plentiful patents kicking around, it’s not clear if Microsoft will ever produce this dual-screen machine. Remember that the company has mulled this idea in the past, and eventually did nothing about it, but here’s hoping this time around things will be different. 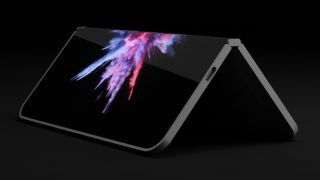 According to the rumor mill, we could see the device in 2019.